It might not sound like a lot, but it is! Five countries and eight states have results in this week’s column, and a couple more are in the preview section. Let’s get going! Emily Hawgood’s hot streak continued with a first-place 7:23 win at the American River 50 Mile. All of the top-three women went under eight hours, and Kristina Randrup and Anna Zielaski were second and third in 7:36 and 7:59. 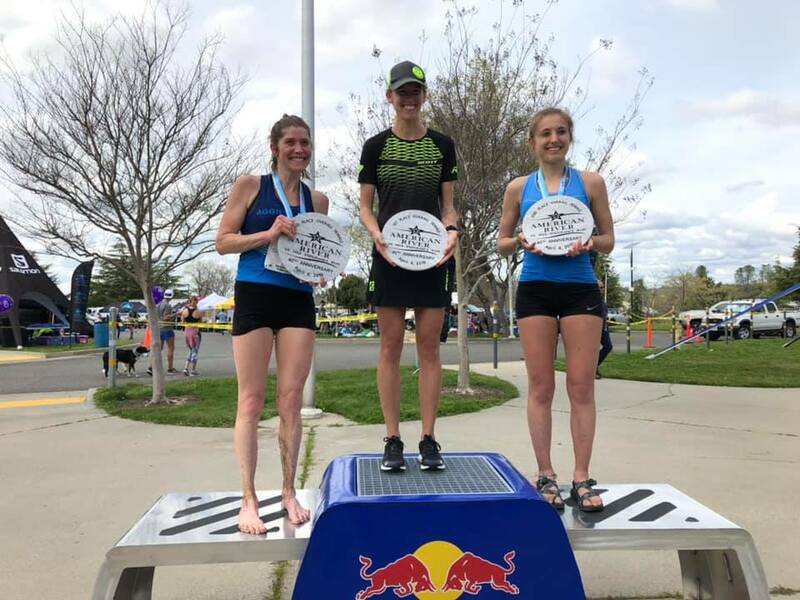 The women’s podium at the 2019 American River 50 Mile. Photo courtesy of race. Pamela Ross ran 3:38 to win the 25-mile option. 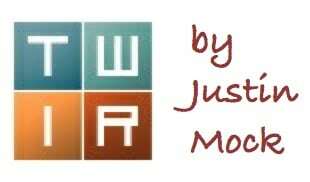 Thanks to UltrAspire for sponsoring this week’s edition of TWIR! The men’s race went down to the wire between Chris Denucci and Reed Breuer. Just 15 seconds separated the pair with Denucci sprinting to first in 6:20. Behind the two frontrunners, Jadd Martinez was a distant third in 7:02. Scott Trummer won the accompanying 25-mile race in 3:00. The 34th Marathon des Sables stage race is underway. There’s a long ways to go – four more competitive stages – before the Saturday, April 13 conclusion, but the race’s opening 32k is in the books and largely went as expected. It’s a completely new terrain for her, but trail running ace Ragna Debats (Netherlands) is finding similar success on the sand. She won the first stage in 2:42 and built a 25-minute lead on second-place Aziza Raji (Morocco). Raji’s 3:07 was followed five minutes later by third-place Laurence Klein (France). iRunFar’s Meghan Hicks started the series fifth in 3:21. 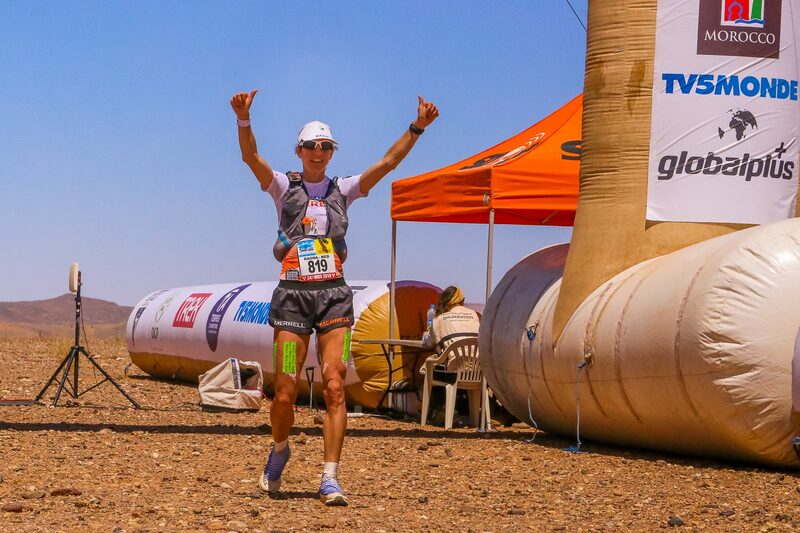 Ragna Debats winning the first stage of the 2019 Marathon des Sables. Photo courtesy of race. Brothers Rachid and Mohamed El Morabity (Morocco) ran together until Rachid, the eldest and the defending race champion, sprinted away to win day one in 2:19. Mohamed followed just 88 seconds later, and third-place Abdelaziz Baghazza (Morocco) finished in 2:22. Alejandro Fraguela (Spain) was the first non-Moroccan finisher on the race’s opening day. He was sixth in 2:30. Julien Chorier (France) was seventh, also in 2:30. 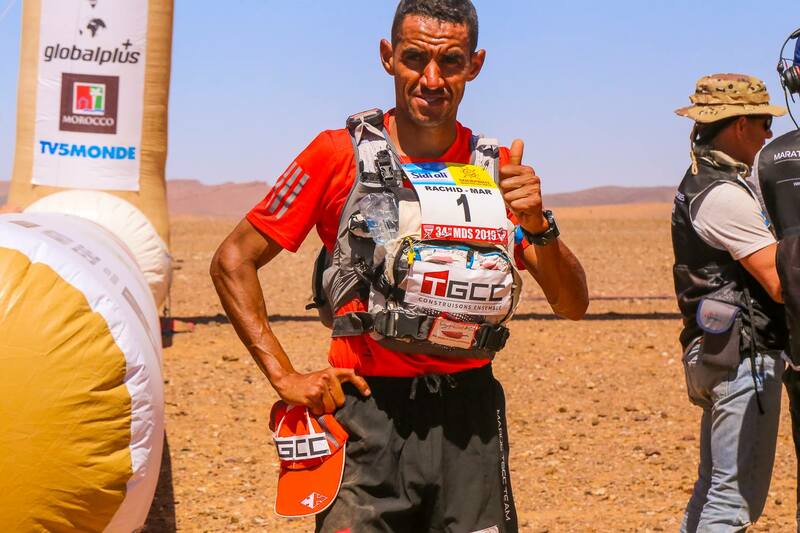 Rachid El Morabity doing what he does, winning stages at the Marathon des Sables. Photo courtesy of race. The Umstead 100 Mile runs fast on an eight-loop course through its namesake state park in North Carolina. Sarah Aponte and Megan Alvarado dueled to 15:40 and 16:21 first- and second-place finishes, and in the men’s race, it was a successful title defense for Olivier Leblond. He finished in 13:34, and that was 30 minutes better than last year. Leblond’s finish ranks third best on this course. He continues to work toward the IAU 24-Hour World Championships later this year. Jim Sweeney was a quick 14:39 for second. Full results. It’s a fast course at Brazos Bend state park southwest of Houston. 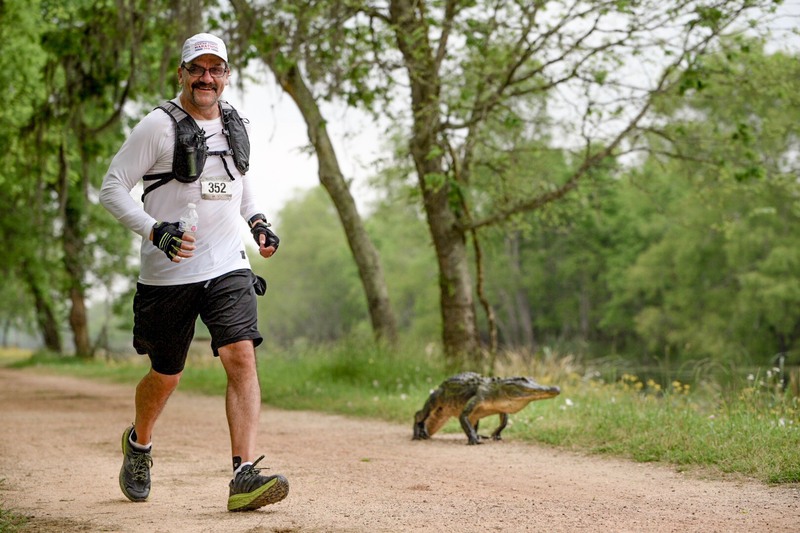 There were 100k, 50 mile, and 50k race options (the 100-mile Brazos Bend race happens later in the year), and there were alligators on course, too! Robin Phelps and Eric Chi won the 100k in 11:35 and 8:54. Heather Gothard and Jeff Ball won the 50 miler in 7:58 and 6:27, and Becky Lowe and Calum Neff won the 50k in 4:33 and 2:59. Both Werner and Neff set new course records. Full results. Manual Silva running with the gators at Brazos Bend. Photo by Jeremiah Justis/Trail Racing Over Texas. The Tejas Trails Hells Hills group of races happen just east of Austin, Texas. Fifth-mile race winners Alison Miller and Joe Schmal ran 9:11 and 7:35, and 50k champs Meredith Terranova and Gerardo Moreno finished in 6:17 and 4:45, respectively. Full results. Ushuaia is in Argentina, but it’s pretty close to the end of the world. Global adventurers Meredith Edwards and Jason Schlarb were there for the first-ever Ushuaia by UTMB ultra. Edwards won the 35k race and Schlarb won the 130k in 15:26, while Rory Bosio won the 130k on the women’s side in 17:49. Word is that deep snow challenged runners further back in this inaugural event. Full results. The heat is on northeast of San Diego at the Oriflamme 50k. Beata Holkovicova and Christian Vanblommestein ran 5:34 and 4:30 to win the race’s 10th-annual run. Full results. This one is in Ohio. The Forget the PR Mohican 50k is held inside of Mohican State Park. 2018 runner-up and 2017 race winner Lee Conner won the women’s race in 6:08. And for the men, down goes the champ! Chad Trumbo had won this race for four-straight years, until Ted Bross came to town. Bross ran 4:14 to edge Trumbo by just over a minute. Full results. 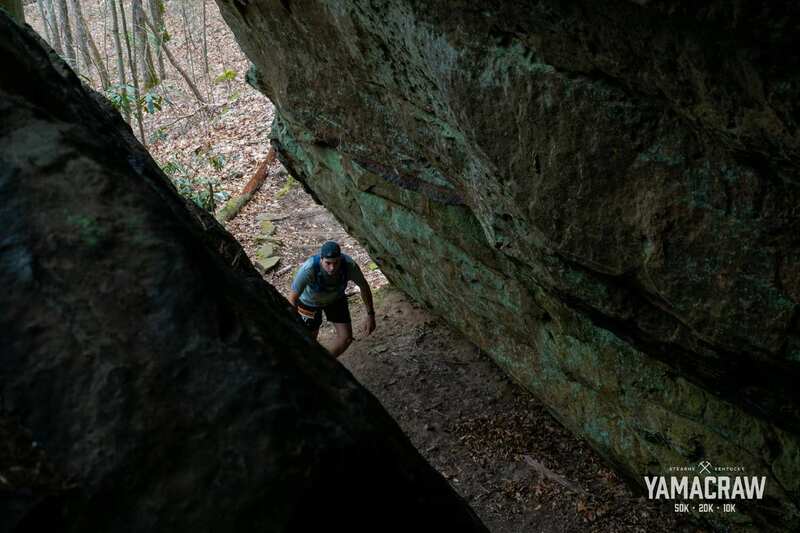 The Yamacraw 50k just looks cool. Every year their Facebook page fills with super-scenic photos of what looks like an incredibly unique course. The Kentucky race goes point-to-point from the Daniel Boone National Forest to the Big South Fork National Recreation Area, finishing at a restored coal town. Alondra Moody and Zack Beavin won in 4:40 and 3:30, and both of those are new course records. Oregon’s Shotgun Trail Blast 50k had a small field–just a single female finisher–but race winners Heather Davison and Nate Jaqua ran 5:11 and 4:23 on the forested course not far from Eugene. Full results. The first-year Long Creek 60k in Virginia Beach, Virginia links up all nine of First Landing State Park’s trails. Mariska Kramer and Stephen Pretak were victorious in 5:34 and 4:44, respectively. Full results. 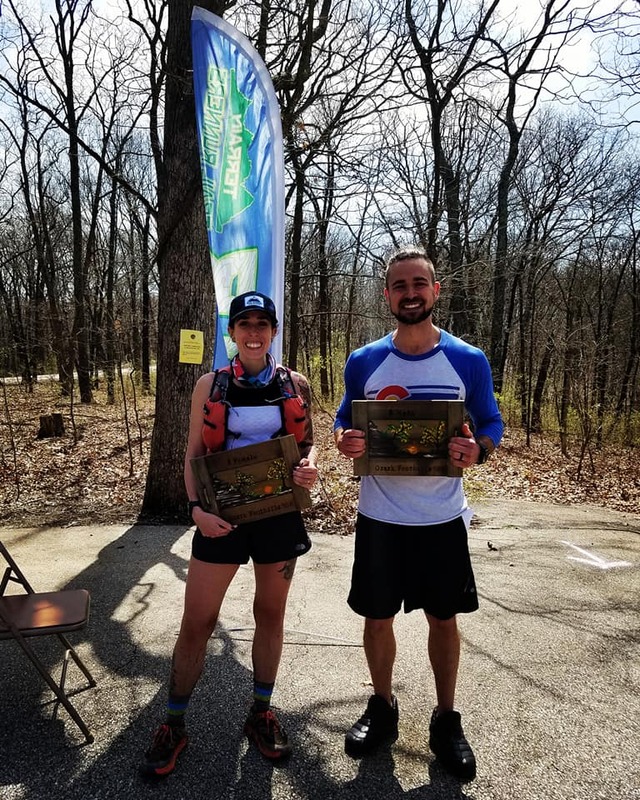 Laurel Hill and Justin Stewart won the Ozark Foothills 50 Mile in Missouri in 10:49 and 7:17. Amanda Smith and Melissa Young followed Hill in 11:44 and 12:20 to take second and third, respectively. Zach Merrin and Jeff Browning were second and third male in 7:23 and 7:32. It was the first year for the 50-mile race, but the 50k distance has a longer history. In that contest Diana Casanova and Adam Ethier won in 5:25 and 4:39. Full results. Photo of the 50k winners, Casanova and Ethier. Photo courtesy of race. Sage Canaday ran 2:23:10 at the Rotterdam Marathon in the Netherlands, and Andy Wacker ran 1:06:07 at the Prague Half Marathon. In Washington DC, Michael Wardian opened the wheels up for a 53:28 sprint at the Cherry Blossom 10 Miler. Rotterdam results. Prague results. Cherry Blossom results. It’s another three-race weekend in the UTWT. All of the 100 Miles of Istria in Croatia, the Patagonia Run 100 Mile in Argentina, and the Penyagolosa Trails 110k (68 miles) in Spain hit the calendar. In Croatia, top female entrants include Michele Yates, though we were unable to locate a full entrant list. It’s the 10th year of the Patagonia Run, and the second for the 100-mile run. 2019 Transgrancanaria champ Pau Capell (Spain) headlines that group. And then in Spain, look for leading contenders to include Gemma Arenas (Spain), Cat Bradley (USA), Cristofer Clemente (Spain), Mario Mendoza (USA), Cody Reed (USA), and Yeray Duran (Spain), among others. Full entrant list. The Lake Sonoma 50 Mile is always one of the year’s most competitive contests. It’s a Golden Ticket race too, and even better–RunFar will be there with pre-race interviews, live coverage during the race, and post-race interviews. It’s a long list of elite entrants with familiar names like Magdalena Boulet, Camille Herron, and YiOu Wang, and on the men’s side guys like Max King, Dakota Jones, and Jared Hazen. Got extra info to share? Psyched for a race this week or last? Let’s use the comments field below for some conversation! Amanda Basham was 1st Female (and 9th OA) at the Sciacche Trail 46km race in Cinque Terre Italy. It has had US women compete every year (Sally McRae thrice, Clare Gallagher and Amanda last year, and Amanda this year). Amanda’s time was the fastest a female has every run in the 5 years the race has been run (3 mins ahead of Clare’s winning time last year). Last year there was a 5km road section added due to a section with a long technical descent and a steep climb back up being closed. This years course was a km shorter but had the full original course with the km less being made up in a steeper climb that missed a longer but less steep climb which was still partly closed from last year. I was 7th this year (and only non Euro male in the top 10) and can confirm this is the toughest course to date (I’ve been out every year course marking & volunteering and raced for the first time this year). Was there an issue with the timing at bb50? A mistake in the upload of results. Well get it fixed. Watch out for Bobby Peavey from Boulder at Lake Sonoma. I’ve heard his mustache can actually act like a pair of wings on the descents. Tom Evans of the UK, third at Marathon des Sables, winner of the 2018 CCC, and third at the 2018 world trail championships, will be at Lake Sonoma. Definitely going to shake things up. Great, great day up at Leona, 3 ultra distances, Rob Krar took the sprint, you can find all the results at Negative Split Running, Keira delivered! Is Zach Miller injured? I figured he’d be in the LS50 this weekend. Seems like all the other top runners are throwing down in tough races this winter/spring except him. Yeah, I believe I remember him posting about a nagging foot injury. Maybe lingering what he dealt with at UTMB last year. Hope in the next few years he takes a run at WS. Reigning 100km world champ Nikolina Šustić of Croatia ran 2:38:47 in the Milan, Italy marathon. NJ Ultra Festival 100 saw its first ever female finisher since it changed venues 4 years ago, as Janna Chernetz-Taylor crossed the line in 29:31. The winner of the men’s race was Billy Richards in 26:38. This was the tenth 100 mile finish of the year for Billy and the eleventh of the year for 5th place finisher Michael Ortiz. Both are hoping to break Ed Ettinghausen’s record of forty-one 100 mile races in a calendar year. 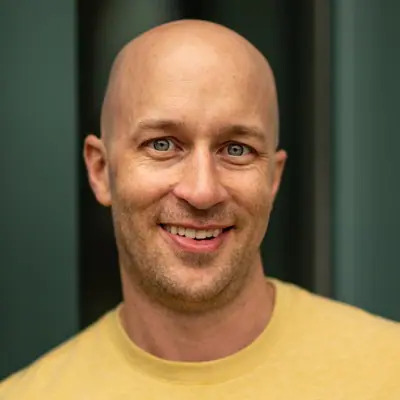 Worth mentioning: Jeff Browning caught a nasty cold ahead of the Ozark 50 miler, but does what he always does and ground out a podium finish regardless.